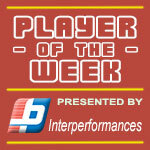 American Forward Dior Lowhorn (201-F-87) had a great game in the last round for second-ranked Satria Muda, receiving a Interperformances Player of the Week award for round 14. The 31-year old player had a double-double of 35 points and 10 rebounds, while his team Satria Muda is placed at 2nd position in their group in Indonesian IBL. Satria Muda is a typical solid league team placed somewhere in the middle or a little bit lower in the standings. But it was their 6th lost game this season out of 11 games. In the team's last game Lowhorn had a remarkable 61.5% from 2-point range. It's his second year at Satria Muda and it's hard to imagine this team without him. Former University of San Francisco star has very solid stats this year. Lowhorn is in league's top in points (3rd best: 23.3ppg), rebounds (8th best: 10.0rpg) and averages impressive 66.7% FGP and 71.4% from behind 3-point line. 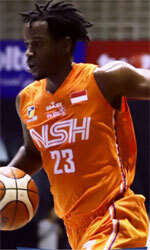 The second best player in last round's games was 25-year old American Madarious Gibbs (185-G-93) of Satya Wacana. Gibbs had a very good evening with a double-double of 31 points and 15 assists. Of course Satya Wacana cruised to a 85-78 relatively comfortable win over slightly higher-ranked Prawira (#5, 3-8). Satya Wacana's 5th position in Red Group has not changed. His team is not often considered as one of the league's best with a mere 4-8 record. Gibbs is well-known at Satya Wacana and is a proven leader in his second season with the team. He belongs to the best scorers in the league with 22.5ppg (#1). He also recorded 4.5 assists per game. Third on the list of top players last round was American forward Qarraan Calhoun (203-F-86) of Pacific Caesar (#3). Calhoun got into 30-points club by scoring 31 points in the last round. He went also for twelve rebounds . He was a key player of Pacific Caesar, leading his team to a 86-80 win against #2 ranked Satria Muda in a game of the week. The chances of Pacific Caesar ranking at the top of Red Group, however are very questionable as they have already lost 6 games, recording just four victories. With bigger assistance of his teammates, Calhoun could help Pacific Caesar to bring them higher in the standings. Calhoun has a great season in Indonesia. After 10 games, he made it on the list of the league's leaders in points with 19.5ppg (9th best) and rebounds with 12.8rpg (3rd best).